This week, two of the best images of Jupiter that I've seen in a long time were published online. One is a blast from the past, as Björn Jónsson released a mosaic he has been working on based on Voyager 1 data. The other is simply the best image of Jupiter I have ever seen taken from by an astrophotographer. 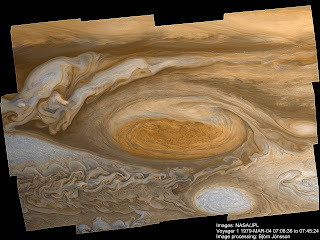 First up is a 12-frame mosaic covering the Great Red Spot and surrounding cloud features. 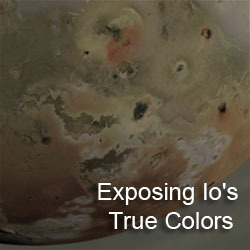 The original data was taken by the Voyager 1 spacecraft the day before its famous encounter with the Jupiter system, and Io in particular. This mosaic was created by Björn Jónsson, who also created another 12-frame mosaic from Voyager 1 data a couple of weeks ago, covering a larger area of Jupiter's southern hemisphere. His processing techniques bring out small-scale details in Jupiter's cloud features, accounts for Jupiter's rapid rotation, and preserves color contrasts without over-saturating the colors (that often plagued Voyager image processing that was performed at the time of the encounter). This gentler approach to the data set allows Jónsson to bring out features such as shadows cast by high, convective clouds on the main cloud decks below. While the Great Red Spot has certainly changed in the 31 years since these images were taken, these remain some of the best color images ever acquired of this giant storm, as Cassini was too far away to acquire high-resolution data, Galileo lacked the bandwidth, and New Horizons' high-resolution camera has only a single bandpass. 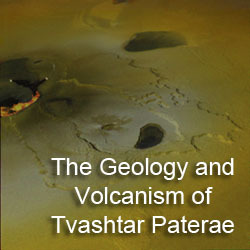 According to Jónsson, "the images I used were obtained on March 4,1979 at a distance of about 1.85 million km. The first image (C1635314.IMQ) was obtained at 07:08:36 and the last one (C1635400.IMQ) at 07:45:24. The resolution is roughly 18 km/pixel." He used orange and violet filter data combined with a synthetic green filter. 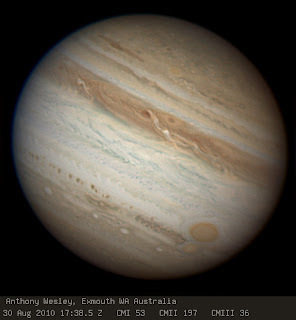 Bringing us back to the present, Anthony Wesley, who is still out at Exmouth in Western Australia, was able to take a spectacular image of Jupiter on August 30. The extraordinary quality of his data were the result of excellent viewing conditions. What makes this image so remarkable is not so much its resolution, but its contrast. For example, you can clearly make out a pattern of waves created by turbulence between the faded South Equatorial Belt and the South Tropical Zone to the west of the Great Red Spot. Because both bands are bright, a high level of contrast is needed to pick out this kind of detail. 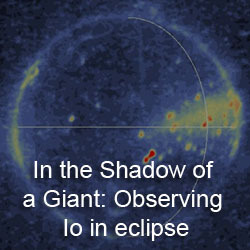 At the time this image was taken, the Great and Little Red Spots were reaching their closest approach, with only limited signs of interaction between the two orange storms. Features are also visible within the Great Red Spot, again feat made possible by the incredible image contrast. Not shown are two bright ovals in the North Equatorial Belt that merged on August 28. Luckily, amateur astronomers were able to catch this merger as it happened, showing them get closer over the last few weeks before spinning around each other and merging.